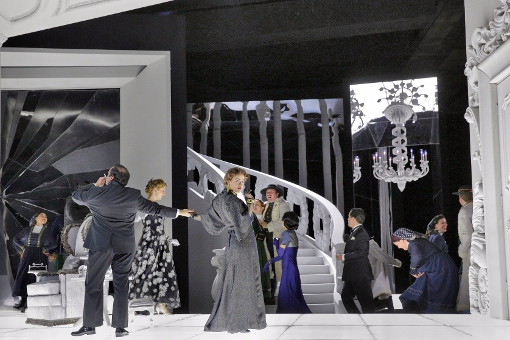 Samuel Barber's 1958 opera Vanessa still has not quite found a place in the repertory, existing on the fringes. 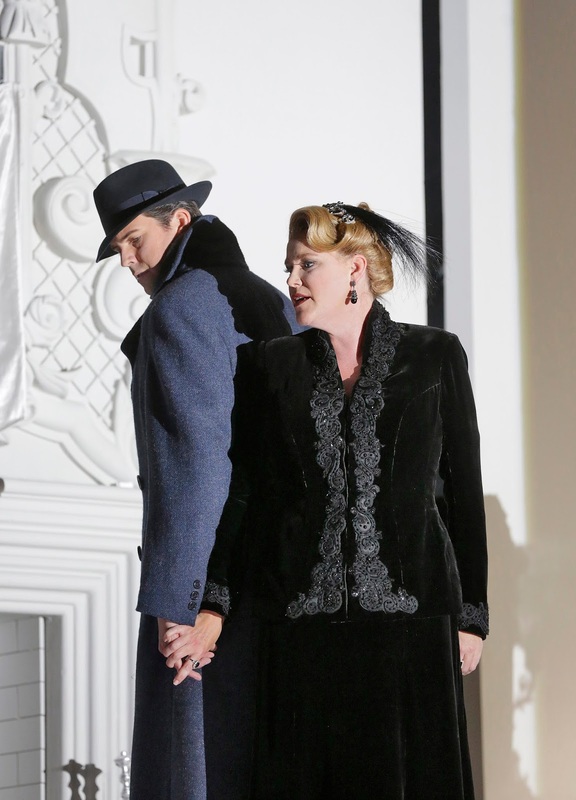 In London the opera has recently only appeared in concert so it was a delight to find Santa Fe Opera doing a production, the first time that the New Mexico festival has produced the opera. Interestingly Wexford Festival is also doing a production of Vanessa this year (directed by Rodula Gaitanou with Claire Rutter in the title role), so perhaps the opera's time has finally come. We caught James Robinson's production on Wednesday 3 August 2016, an evening which was cool and cloudy with torrential rain, perhaps an apt environment for Gian Carlo Menotti's rather gothic libretto. Leonard Slatkin conducted, with Erin Wall as Vanessa, Virginie Verrez as Erika, Helene Schneiderman as the Baroness, Zach Borichevsky as Anatol, James Morris as the Doctor, Andrew Bogard as the Major-Domo and Andrew Simpson as the Footman. Sets were by Allen Moyer, costumes by James Schuette, lighting by Christopher Akerlind and choreography by Sean Curran. Gian Carlo Menotti's libretto has its rather melodramatic side (someone once commented that he had written it using the Oxford Book of Cliches), and James Robinson's production built on this by staging the work in the context of a Hollywood Noir film, complete with a set inspired by Hollywood Regency designs. 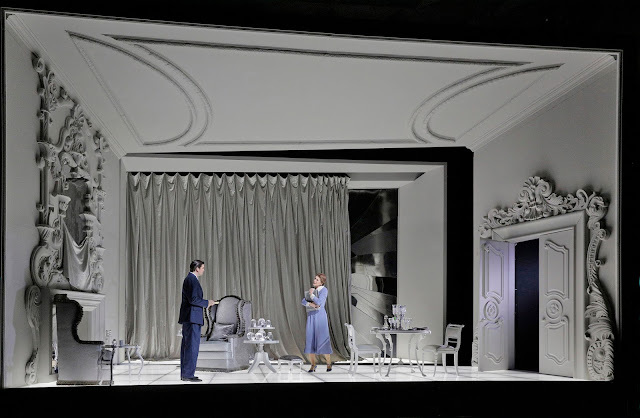 Apart from the costumes for the ball scene in Act Two, the entire production was in shades of grey with Allen Moyer's striking box set, lit by Christopher Akerlind's lighting, having real sense of coolness about it. As light comes back into Vanessa's life, the set imaginatively fractured and expanded, but retreated back with Erika's retreat into solitude at the end. James Schuette's costumes were similarly stylish, all 1940's glamour. The result was to give the production a lushness which matched Samuel Barber's music. At its best the production really made sense of the staginess of Menotti's text and the rather melodramatic quality to the story. But you felt that a more austere, critical production style might have brought out some more of the psychological depth of the piece, rather than simply echoing the gorgeous lush quality to the music. And there are interesting undercurrents, is Erika in fact Vanessa's daughter, how does the plot echo elements on Barber and Menotti's personal life, Vanessa's great affair with Anatol's father clearly took place whilst the man was married with at least one child. Robinson took the piece at face value, and did not dig too much beneath the surface, and occasionally I kept wondering what a director like David Pountney would make of the opera. 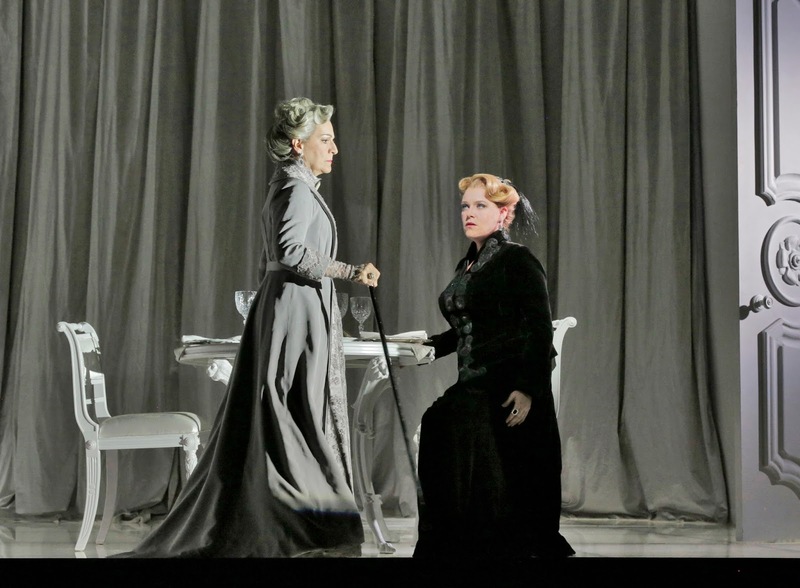 The title role was written for a dramatic soprano capable of great lyric beauty. Erin Wall showed superb control and poise as Vanessa, and her opening aria 'Do not utter a word' was superbly controlled with a perfectly fine sense of line and intensity. 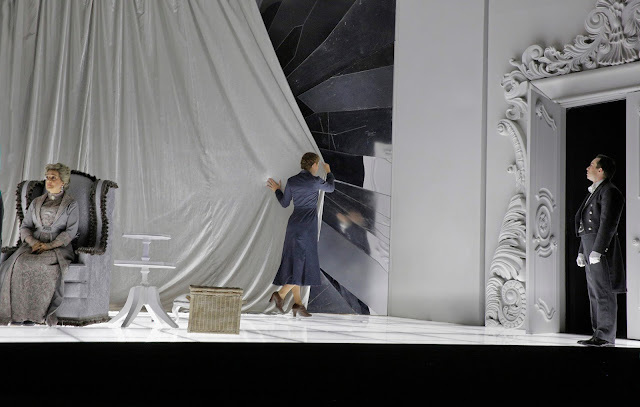 Throughout the opera, Wall showed this combination of lush beauty of tone and sense of line, matched by the very stylish figure she cut on stage. I cannot think of ever hearing the role more beautifully sung, but I felt that a slightly more dramatic voice might have been able to dig a bit deeper into the psychological complexities of the piece and make Vanessa a rather more meatily intense character. Apart from the famous moments, Vanessa and Erika's arias and the quintet, the opera is very much about lyrical dialogue, the sort of melodic noodling which Richard Strauss did so beautifully. To bring this off the singers need to bring out not only the text, but the psychological undercurrents. At Santa Fe the singer who really brought this out was the great Wagnerian bass, James Morris as the Doctor. Morris gave a masterclass in expressive dialogue. It is in fact quite a small role, an observer rather than a participant in the overheated Ibsenesque games but Morris made it count in so many ways and you wished that a little more of this had rubbed off. Virginie Verrez made finely elegant Erika, quite lyrically light of voice but with a superb sense of Samuel Barber's lyrical vocal line and an ability to suggest some of the strange emotional undercurrents which are going on in Erika's head. English is not Verrez' first language, and though she had something of an accent she was still highly communicative. Erika is really the focal point of the opera (Maria Callas famously refused the title role because Erika was the more interesting part), and Verrez successfully brought this out, though there were times when I wanted even more intensity, perhaps even at the expense of beauty of line. The Baroness spends most of the opera silent, and Helene Schneiderman had a nice line in body language (though it has to be admitted that D. thought her pursed lips expression in Act One alarmingly reminiscent of Mrs Slocombe). When she did sing, Schneiderman really made her contributions count. Zach Borichevsky certainly had the physique du role, looking every inch the dramatic hero of a Hollywood melodrama. Borichevsky never quite made us understand who this character was, seeming a little too reactive perhaps. Borichevsky's voice took on a rather over-intense quality in the upper register so that it lacked the ideally plush ease which the character needs, but he really brought out the sexily casual nature of Anatol's manner, convincing as the love interest. As I have said, James Morris really brought the Doctor to life, making the character tell every moment on stage without pulling focus. The other two roles, the Major-Domo and the Footman were finely sung by Santa Fe Apprentices, Andrew Bogard and Andrew Simpson. This was a finely sung account of a profoundly beautiful score, but it was a performance which seemed content to enjoy the lushness of Barber's music and not to dig too deep under the surface. There is scope, I think, for another deeper approach. In the pit Leonard Slatkin brought his great experience of the piece (Slatkin recorded it in 2002 with Christine Brewer and the BBC Symphony Orchestra) and really inspired the Santa Fe Opera orchestra highlight both the lyrical beauties and the complexities of Barber's score. Having finally seen Vanessa, I am intrigued by the combination of complexity and beauty in the piece. Robinson and his cast, successfully brought out the real beauty of the piece and I hope that the spell cast convinces people that this is an opera worth exploring.